Beach Hut 8401263 715779work01603 870304fax Self-cateringBeach hut 84 is a traditional Norfolk beach hut with a twist, its situated mid-way along the vast sandy beach of Wells-next-the-Sea. Beach hut 84 has a fabulously brightly coloured tropical theme throughout. Enjoy sun, sea and sand, a perfect place to sit on the veranda and watch the big Norfolk sky, unwind, relax and watch the world go by. This beach hut is well equipped with a kitchen area with white painted cupboards, a good range of crockery and cutlery, gas stove, kettle, water container (a tap is nearby), table and chairs, deckchairs and sun loungers. This hut has everything you need to enjoy your time at the beach with fun for all the family! The beach hut is also well stocked with beach games, wind break and the must have buckets and spades. 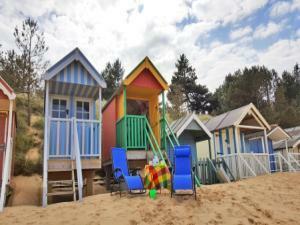 You do not have to be staying at one of our holiday cottages to book Beach Hut 84. It is available for weekly rental only. Bookings available all year. Notes: The beach hut cannot be used for sleeping overnight. Beach Hut 84 does not qualify under our cancellation protection scheme. Beach hut 84 is a traditional Norfolk beach hut with a twist, its situated mid-way along the vast sandy beach of Wells-next-the-Sea. Beach hut 84 has a fabulously brightly coloured tropical theme throughout. Enjoy sun, sea and sand, a perfect place to sit on the veranda and watch the big Norfolk sky, unwind, relax and watch the world go by. This beach hut is well equipped with a kitchen area with white painted cupboards, a good range of crockery and cutlery, gas stove, kettle, water container (a tap is nearby), table and chairs, deckchairs and sun loungers. This hut has everything you need to enjoy your time at the beach with fun for all the family! The beach hut is also well stocked with beach games, wind break and the must have buckets and spades.